Swing trading is all about taking calculated risks to increase your portfolio. Because of the inherent risks of swing trading, it makes sense to cover the fundamentals before you get started. You need to know how to judge an industry’s strength in the market, identify good candidates to swing trade, and most of all, manage your risk as best you can. You want to be flying high from your profitable trades, not swinging low. Being a successful swing trader calls for many skills, including the ability to assess the relative strengths of various market sectors. 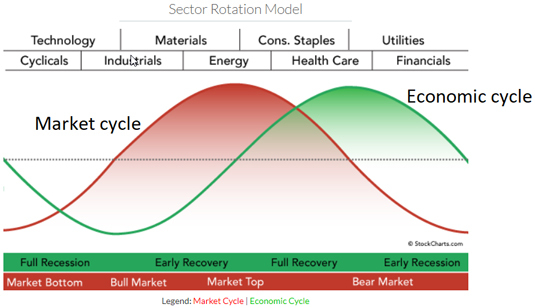 If you determine which stage the economy is in and then use that information as you review the following chart, then you’ll have a good idea which economic sectors are likely to lead the market in the near future. The market is on your side. A rising tide lifts all boats. And before you buy, make sure the public equity market (for the country where you are buying the security) is in a solid uptrend. The industry group is on your side. Stocks tend to follow their industry groups up or down. If the security’s industry group is a strong uptrend, chances are your purchase will be profitable. If you’re trend trading, buy on a technical signal or a breakout of a chart pattern: The stock should be entering an uptrend (from a chart pattern) or resuming an uptrend on a technical signal. Use the ADX indicator to determine whether a trend exists. If you’re trading ranges, the candidate has just bounced off of support/resistance with a technical indicator confirmation. Watch for the technical indicator (an oscillator) to generate a buy signal. Divergences between your oscillator and the price action signal higher-confidence trades (for example, a stock falling to a support level while the oscillator, such as stochastics, traces a higher low and indicates underlying strength). The fundamentals back the technicals. Pair your great chart setup with strong fundamentals. And no, you don’t need to spend 25 hours reading a company’s financial statements. Simply verify the important items, such as financial health, return on equity, P/E ratio, and expected earnings growth rates. The stop-loss level is near your desired execution price. The best swing trading candidates are those where your emergency exit is nearby. The closer your desired entry price is to your stop-loss level, the less you stand to lose if matters turn ugly. But don’t place your stop loss at a level so close to the market price that a small insignificant move forces you out (as with most things in life, there must be a balance). You allocate the right amount to the trade. Loss is always possible, even with the best swing trading candidate. Set your position size in accordance with your trading plan, which should put an absolute ceiling on your position size and set a maximum percentage of capital you’re willing to lose on a single trade and for the entire portfolio (remember, shark bites versus piranha bites). Is the security a penny stock (hopefully not)? Set the position size based on the percentage you’re willing to lose (0.25 percent to 2 percent of total assets). Set the risk level as a straight percentage of assets and that percentage doesn’t exceed 10 percent of your total portfolio. Is your portfolio diversified? Make sure your positions are spread among different market capitalizations (for example, large cap, mid cap, and small cap), different sectors, and asset classes (not to mention domestic and international securities). Each security in the portfolio has a risk amount equal to the difference between the current price and stop loss level. The difference on an individual security level is tight — around 0.50 percent. The sum of those differences doesn’t exceed 7 percent of the total portfolio value. The stop loss levels are at a level representing a profit (barring a gap in prices, of course). Cut losses when your stop loss is hit — no questions asked.